Since I posted that short piece about motherhood yesterday it is as if a dam has burst. Behind the wall of my self control All the grief and anxiety that I feel for my son, my home situation, my partner has been building. With no outlet my emotions have been swirling and multiplying , until a small hole appeared in the dam. By writing, and more importantly posting as I did, a small crack appeared in the facade – and as in a real life dam, the pressure on that crack leads to a bigger andbigger aperture being formed – and the suppressed emotions gush forth. 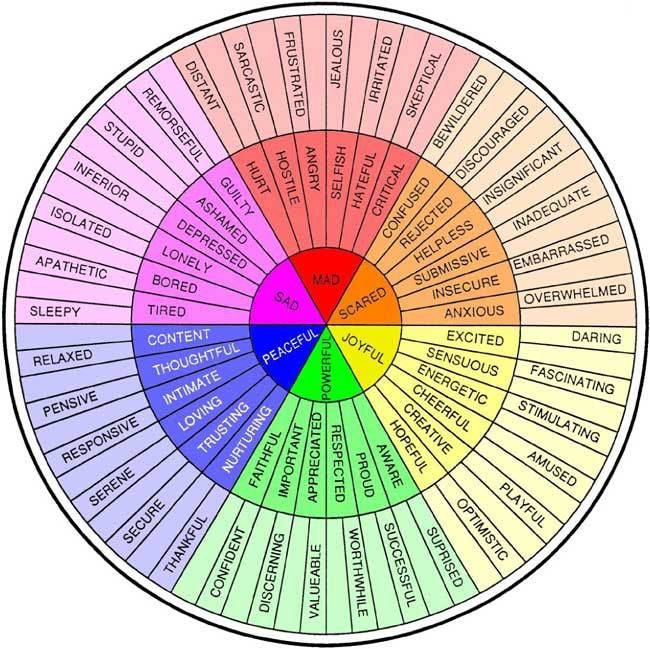 I think I feel everything in the top half of this wheel ( except perhaps bored) although I am bored with the conflict so perhaps that applies too. It’s Sunday. I have a yoga class later and I will walk Lola ( who submits to being wept over with good grace, and licks my tears away. ( as an aside I used to think that dogs licking people was disgusting, but I find Lola’s sympathy licks, and her obvious concern for me rather comforting) I have no idea how I am going to get myself together to go back to work tomorrow. I feel like I have just fallen apart completely. Outside of the immediate grief, it has occurred to me that maybe this is like a bereavement. The loss of a ‘normal’ relationship with my son. And if this is at least in part a bereavement reaction, then I’m on more familiar ground. The above is the well known ‘grief cycle’ as described by Kubler Ross in the late 60’s. Although first developed for and applied to the death of a loved on, this journey through emotional adjustment can be applied to many different losses. It’s not as simple as a linear progression of course, which is why I have chosen this twisted ribbon picture, to illustrate the nature of the meandering process. At the moment for example, if I apply this analogy, I am somewhere with elements of anger, depression, detachment and dialogue. I feel stuck here, it’s not much different to where I was 3 years ago, although with perhaps less hope. Maybe this has become a complex, non resolving bereavement reaction. Maybe I need to do something different. Maybe writing this post is a start.